There are some personalised gifts that are trendy and of the moment, and some that never go out of fashion. Personalised Golf Gifts are definitely in the latter category. If fact, in my professional experience I would say that they are growing in popularity. The sport of golf has never been more accessible and popular. It is loved all over the world by many people, both male and female. Amateurs and professionals love nothing better than teeing off for a round of golf with friends, family & colleagues. It’s because of this that personalised golf gifts are such a practical and extremely desirable promotional product. Whether the recipient is just a beginner starting out or a complete pro, a personalised golf gift will most definitely go down well. They suit all ages and abilities and there are so many promotional items to choose from. Below we have highlighted 3 of the most popular. Three of our Most Popular Personalised Golf Gifts. 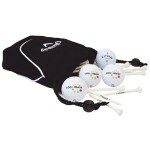 If you’re putting together a promotional campaign you may already be using golfing gifts. They are extremely popular for corporate hand-outs and welcome packs. Golf goody bags have much to offer in the way of promotions. They have varied contents which can appeal to all kinds of golf lovers and cover many price categories. Not only that, each promotional item in the goody bag can also be custom printed and personalised. 2. Poker Chip Golf Ball Markers. 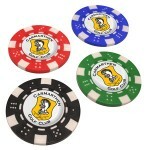 Play golf Vegas style with these personalised poker chip golf ball markers. If you’re looking for an ultra-cool golf gift then these poker chip golf ball markers are absolutely perfect. They come in a range of colours and are made from hard wearing plastic. They can be individually personalised by having your company logo or brand message printed in the centre of each marker chip. 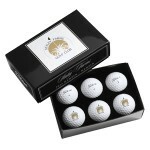 N o list of personalised golf gifts would be complete without golf balls. Personalised golf balls are easily the most favoured golf gift. These days you can pretty much buy any brand of golf ball from all the major suppliers and get them personalised. Most companies that offer custom branded golf balls will have a large variety of quality branded balls to choose from.